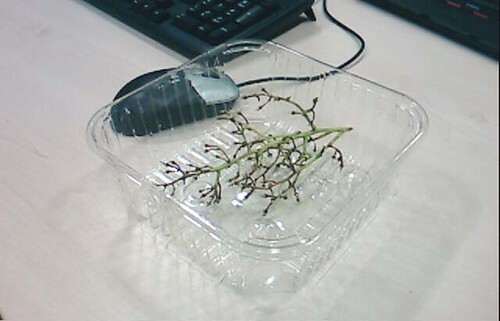 On my way into work this morning I picked up a box of seedless white grapes* from Marks and Spencer to eat at work. They had to be seedless, I can’t be doing with pips – far too much hassle. And very undignified to be spitting out pips at your desk, don’t you think? I do like grapes and these ones looked particularly good – plump, crisp and firm. Irresistible. I’d barely sat down and turned on my computer before I began mindlessly picking the grapes off one by one and popping them into my mouth, my eyes leaving the screen for the briefest of moments. Biting into their crispness and bursting them in my mouth, savouring the sweet juice as I read another email. Delicious. Addictive. Very addictive. ‘There are a lot there’ I thought to myself at one point, ‘Better not eat them all’. Hmmm…by the end of the day they were gone – all 600 grams of them. Now that’s just pure greed. Still, better grapes than chocolate.